This story, while pulling the reader into a maze of family ties, contains numerous terms for such ties. 1. "produced a child" reflects (一児を設し ichiji wo moukeshi, ichiji o mōkeshi). 2. "house maid" reflects (家婢 kahi) -- more generally a "woman who served a household" as a servant or slave. 3. "second wife" (継妻 keisai) -- more generally a "successive wife" or "step wife" -- as distinct from a first wife or former wife, from which the man has been separated by death or divorce. 4. "daughter" (娘 musume) -- meaning also a "young girl" or just "girl". 5. "wife" (妻 tsuma) -- the general word for wife. 6. "son" (嫡子 musuko) -- graphically "chakushi" meaning "legitimate child" as opposed to a stepchild. 7. 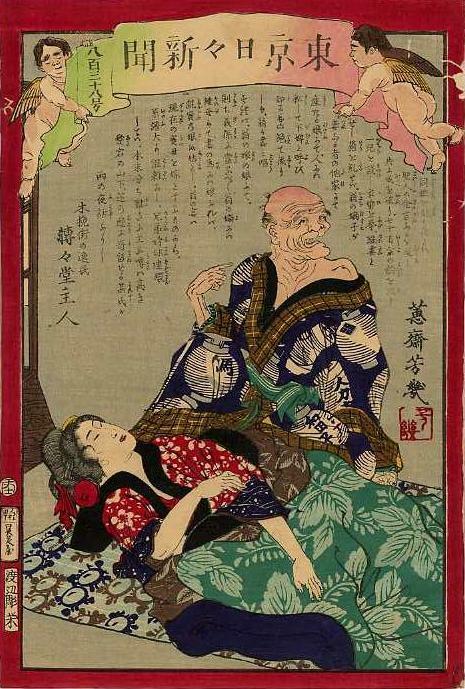 "old man" (翁 okina) -- sometimes used as a title of respect that could be rendered "venerable gentleman". 8. "another house" (他家 take) -- as opposed to her own household or the man's household. 9. "maidservant" correspondes to 下婢 (gejo), which is graphically "gehi". The word corresponding to the furigana reading "gejo" is usually written 下女 -- or "lower woman". 10. "daughter-in-law" (嫁 yome) -- meaning either "bride" or "daughter-in-law" -- as a woman who becomes a bride typically joins her husband's family as a daughter-in-law. 12. "child by his first wife" (嫡 ko) -- graphically a man's principle wife, used also to designate a legitimate child, especially a son, she bears him. 14. "daughter" (娘 ko) -- graphically "girl" or "daughter". This graph -- as well as 女 (onna) -- is commonly used for "ko" when referring to a woman, such as a club hostess, as a "girl". 15. "mother-in-law" (姑 shuutome, shūtome). 17. "Retiree of Kobikimachi" (木挽街の逸民 Kobikimachi no itsumin). 逸民 (itsumin) means either a "recluse" or a person who has no official post and does as he pleases. Tentendō Shujin (Takabatake Ransen) similarly styled himself "Recluse of Kobikimachi" (木挽街の隠士 Kobikimachi no inshi) in the by-lines of TNS-1027, TNS-1036a, and TNS-1052. Kobikimachi referred to Kobikichō (木挽町) in Ginza where Takabatake actually lived.